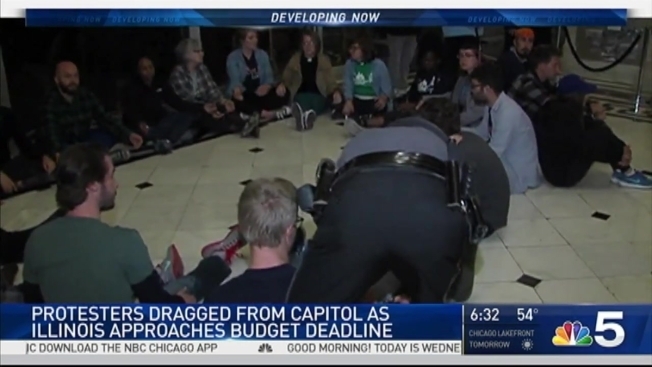 Charges are pending against nearly three dozen demonstrators after protesters stormed the state Capitol in Springfield as lawmakers continued to battle over the state's ongoing budget woes. Susan Carlson reports. Charges are pending against nearly three dozen demonstrators after protesters stormed the state Capitol in Springfield as lawmakers continued to battle over the state's ongoing budget woes. Thirty-four activists, who were part of a March to Springfield, gathered in front of Gov. Bruce Rauner's office Tuesday, refusing to leave until state police arrived. With lawmakers set to adjourn Wednesday at midnight and no budget deal in sight, activists expressed their disdain that lawmakers have yet to reach a compromise on Illinois’ 700th day without a budget. "What do we want? Universal mental healthcare," they chanted. "When do we want it? Now." Just after 10:30 p.m., those refusing to move were arrested. About a dozen protesters were also removed from the Illinois House of Representatives on Tuesday after disrupting one of the final days of the legislative session. It was not immediately clear if they might face charges as well. "There are people in the General Assembly who agree with us," Rauner said Tuesday. "We need to change. The system is broken." The activists arrested Tuesday night could face charges for criminal trespassing.